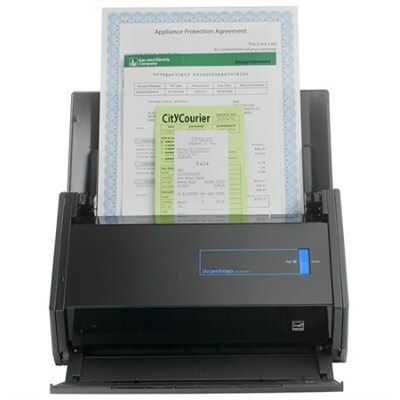 ScanSnap Cloud quickly delivers scans from your ScanSnap iX500 scanner to your favorite cloud service, without the need for a computer or mobile device. Simply press the Scan button. ScanSnap cloud automatically separates your data into documents, receipts, business cards and photos and delivers them directly to your favorite cloud service. Image processing: Automatic corrections and image output. ScanSnap iX500 can quickly scan business cards, extract the content information and place it into editable fields that can be exported to Address Book, Excel, Salesforce, and other contact managers. ScanSnap Receipt allows users to easily scan and extract information from receipts, and export the data into CSV for easy tax filing. ScanSnap Receipt also supports multiple languages and currencies. Normal Mode without Carrier Sheet: A4, A5, A6, B5, B6, Business Card, Post Card; Letter, Legal and Custom Size, Max: 216 mm X 360 mm (8.5 in. X 14.17 in. ), Min: 50.8 mm X 50.8 mm (2 in. X 2 in. ), Automatically recognizes document size.